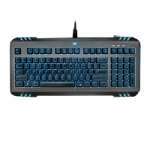 Designed exclusively for StarCraft® II: Wings of Liberty™, the Razer RZ03-00440100-R3U1 Marauder StarCraft II Gaming Keyboard is a full featured, tournament ready keyboard with an extremely compact design. The Razer RZ03-00440100-R3U1 Marauder StarCraft II Gaming Keyboard's elevated keys are perfected for rapid commands and improved gaming performance. Your increased performance is monitored by an all new APM (Actions-Per-Minute) Lighting System that provides real-time performance feedback through changing color hues for a completely immersive gaming experience. Enhanced with a dedicated on-the-fly macro recording system, the Razer RZ03-00440100-R3U1 Marauder StarCraft II Gaming Keyboard is built with a gaming optimized design that reflects the StarCraft II universe and bolsters the gameplay experience.